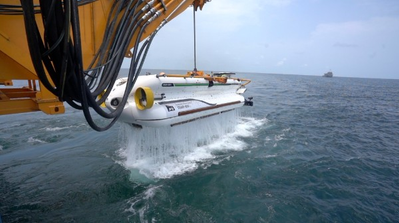 JFD, part of James Fisher and Sons plc, completed the first open sea launch, dive and recovery of the deep search and rescue vehicle (DSRV) for the first of two 3rd Generation Submarine Rescue Systems being delivered to the Indian Navy, the company announced. The DSRV completed a full launch deployment, dive and recovery in open sea, replicating the operating conditions of a real submarine rescue operation. The completion of this phase of open sea trials represents a significant milestone in the ongoing delivery and acceptance of the 3rd Generation Submarine Rescue System, which is grounded in a rigorous trials and testing process that ensures the highest safety standards are upheld. Following the delivery of the first system to the Indian Navy in April this year, JFD deployed a team of 30 expert personnel to India’s west coast to support the mobilization followed by a period of rigorous sea trials, working in close partnership with the Indian Navy who provided the commercial mother ship and associated trials consort vessels. The Indian Navy's west coast based rescue team, who will operate the system when in service, were active participants throughout this phase of the trials. 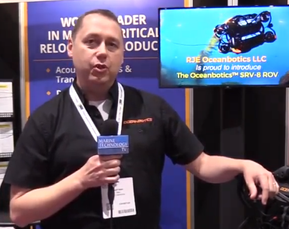 Speaking on the development, Ben Sharples, India DSRV Project Director at JFD said: “The completion of this phase of open sea trials for the first DSRV is a significant milestone in the delivery of the first of two highly advanced 3rd Generation Submarine Rescue Systems. As well as forming part of the contractual acceptance, it’s an important stage as we look to ensure the safe operation of the system once in service. The 3rd Generation Submarine Rescue Systems incorporate an innovative new system design and tightly integrated components to ensure time-to-first-rescue (TTFR) – the time measured between system deployment and commencement of the rescue - is minimized. In the event of an accident, this maximizes the chances of a successful rescue, which is crucial in protecting the lives of submariners.